If the roofing of a flat roof is in bad shape and leaks occur regularly, it might be necessary to replace the roof. Sometimes a whole roof renovation is required, whereas a replacement of the roofing will suffice in other cases. Replacing a flat roof is also the perfect opportunity to install insulation. In this article, you can read more about the price and the possibilities to replace or renovate a flat roof. Bituminous roofings are frequently applied on flat roofs because of their long life span, minimal maintenance and good price-quality ratio. There are two sorts of bitumen: APP and SBS. APP bitumen (Atactic PolyPropylene) is a polymer-based type of bitumen. The difference is that SBS bitumen (Styrene-Butadiene-Styrene) is provided with a protective top coat, as opposed to APP bitumen. Quality-wise, both types of bitumen are equally good, but they are used for different specific applications. 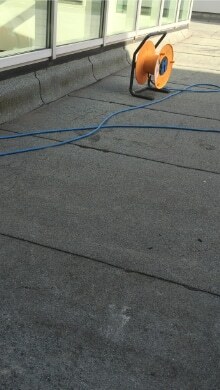 A bitumen flat roof is applied with a burner. Because of the heat, the bitumen becomes fluid so it can stick well. As a result, you get a thick seal. Bitumen is available in several colours. A finishing with chippings (slate) is possible as well. EPDM (Ethylene Propylene Diene Monomer) is synthetic rubber. As is the case with bitumen, polymers are used for the production of EPDM in order to make the rubber extra strong and elastic. EPDM foil is very suitable as roof covering as it is strong, UV resistant and maintenance-free. Next to that, it has a very long life span. EPDM is also protected against root growth, as a result of which it is perfectly compatible with a green roof. EPDM is not heated with a burner. 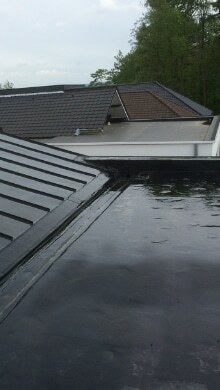 Instead, it is processed cold and applied onto the roof with glue. PVC (Polyvinyl chloride) is a plastic which is fit for a watertight seal of flat and pitched roofs. It is available in different colours, but most of the time a grey colour is chosen because of its coulour fastness. The life span of this material is slightly shorter than other roofings (20 years on average), but the quality is the same. The material is lightweight as well, which can be advantageous in case of renovation. 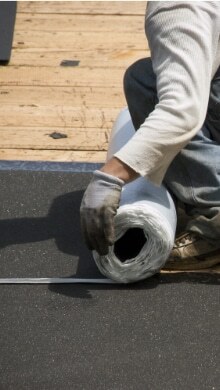 A PVC roofing is directly applied onto the foundation by means of glue. PVC is resistant to roots, as a result of which it can also be used for green roofs in combination with a fibreglass reinforcement layer. 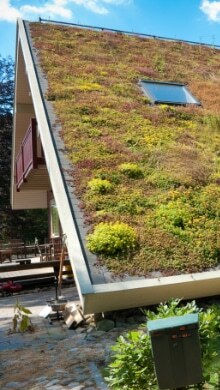 A green roof is a standard roof that has been adjusted for vegetation. Special vegetation- and drainage layers are applied onto a green roof. This way, the plants can grow well and excessive rain water will drain fluently. A flat roof is perfectly suited for this end. As for the vegetation, one uses plant species that are resistant to damp and drought such as grass, mosses, herbs and succulent plants. Thanks to the vegetation, the roof will be better protected against weather influences and temperature fluctuations. Moreover, a green roof has thermal and acoustic insulation properties. Green roofs are environmentally friendly as they help to remove harmful particular matter from the air. ⇒ Request free quotes for a green roof. TIP: Apart from the chosen roofing material, the price of a flat roof replacement also depends on the current condition of the roof. If the old roof construction is no longer in good shape, you should take into account extra costs for the removal of the old roofing and ballast layers. Is the roof construction still adequate? The new roofing can then be applied on top of the old roof covering. This will save you costs and working hours. You can also save money by doing some of the work yourself (for example removing and carrying off the gravel). When comparing quotations, look which costs are included and which are not (aluminium roof edges, roof gutters, etc.). You can, without obligations, compare prices and quotes via our quotation service. Click here for more information. We speak of a warm flat roof when the insulation is applied on top of the roof construction. The eventual roof covering will be installed upon the insulation. A great advantage of this method is the protective function of the insulation material. The roof is heated, as well as the space underneath. This way, the roof is less prone to temperature fluctuations. Consequently, the shrinkage- and expansion tension in the roof construction and roof seal will be lower. This method of insulation is called ‘insulating according to the warm roof principle’ and is applied most frequently. It is especially used in situations where the old roofing is in bad shape and therefore needs to be removed. In case of a cold flat roof, the insulation material is applied to the bottom side of the roof boarding. This way, the roof covering lies on top of this supporting construction. This implies that the roof is not heated by the underlying room, and it is prone to several weather influences. As a consequence, the roof construction and sealing layer will shrink and expand, which will cause damage over time. There is also a higher risk of rotting, as enclosed damp cannot easily escape from this construction. For this reason, the cold flat roof principle is not as interesting as compared to other possibilities. This insulation method is not applicable if you do not intend to renew the flat roof entirely. The existing roof covering remains in place in the case of an inverted flat roof. The insulation material is positioned on top of the current roofing and provided with a ballast later to make sure everything stays in place. The existing roof covering functions as a water barrier. It is important to make sure the roof can bear the weight of the ballast layer. The roof construction should not be damaged either. An inverted flat roof does not insulate as well as a warm roof, but it is much cheaper since you do not need a new roofing layer. Which roof covering to choose? How and with which material the roof should be finished best, depends on the way the roof will be burdened in the future. 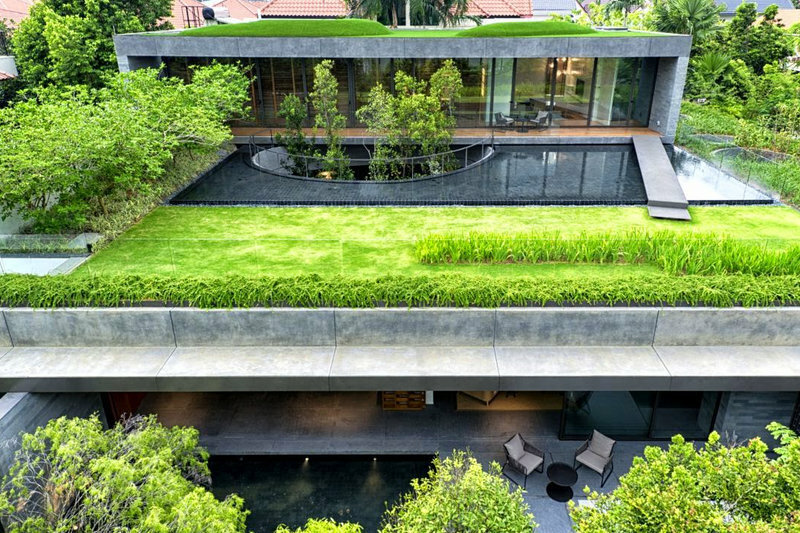 A roof with a roof terrace on top of it requires a complete different approach than a green roof or a roof that will never be walked upon. Pay attention to a bitumen roofing: In case of a roof with a bituminous cover, the eaves commonly wear out fastest. This has to do with erosion of the covering layer (mostly slate) and UV rays of the sun. It is advisable to inspect the eaves regularly and, if necessary, to have them sprinkled again. Is there gravel on the roof? Retain a layer thickness of minimal 1.2 inches. In places where the gravel tends to fly away, you can put down a concrete tile. However, mind sharp edges; these might damage the roofing. Does water often remain on a flat roof? Then something is probably wrong with the slope of the roof. This can easily be repaired during renovation work. Save on the costs: You can save money by carrying out some of the work activities yourself, for example removing the gravel and the drains. Be alert when comparing quotes: When you are comparing quotes, check which costs are included and which are not (aluminium roof edges, roof gutters, and so on). Compare price offers of different suppliers. This way, you can compare prices, terms, materials, work methods,… This way, you can choose the offer that suits your situation and wishes best. On the quote page, you can request free and non-binding quotes for a flat roof replacement.